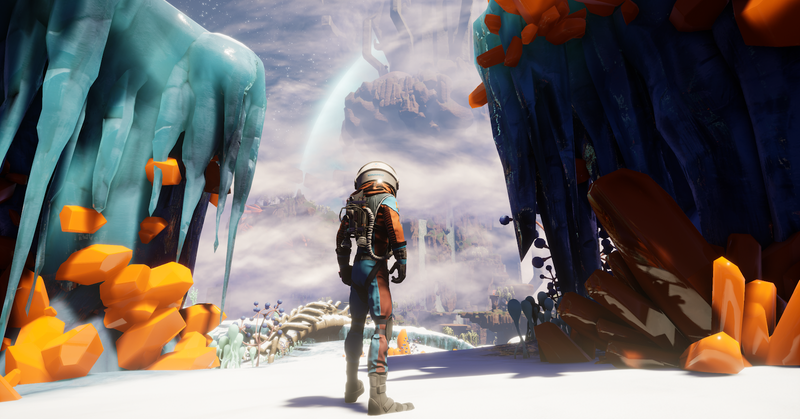 Journey to the Savage Planet was a bit of a surprise when it was announced at the most recent Game Awards. The development studio, Typhoon Studios, comprises several Assassin’s Creed alumni, and the wacky science-fiction antics in the trailer were a far cry from those games. It was hard to grasp exactly what the game was. Last week, I saw a demonstration helmed by Typhoon Studios creative director Alex Hutchinson. The game captured a sense of classic pulp adventure and mixed that with some anti-capitalist satire, offering a colorful world I’m cautiously curious to explore. Players take the role of a corporate explorer working for Kindred Aerospace. The goal is to document discoveries on a distant uncharted world while gathering materials to craft Kindred’s patented products. There’s a tongue-in-cheek conflict of genuine awe and cartoonish corporatism as you move through zones and try to uncover hidden ruins. The players land on a planet they were told was a wasteland; instead, it’s packed with life and signs of civilization, including a massive tower in the center of the map. Hutchinson encountered a variety of locations and wildlife as he explored. The world shifted from icy tundras to lava-packed caves to verdant forests. He passed by strange one-eyed space chickens that would duplicate if attacked, and he slinked away from growling wolf-like beasts. Everything could be analyzed with a Metroid Prime-esque scanner. Upon reaching a dead end, Hutchinson returned to his junky spacepod-turned-home-base and crafted a grappling hook to proceed to new areas. The Metroid influence was even more clear. This was less a No Man’s Sky-style open world and more of a lighthearted, free-form dungeon crawl with dozens of paths and potential secrets. While Journey to the Savage Planet’s title might sound like old-school ’50s pulp, the term savage has a historic use as a slur against native peoples. It evokes images of colonialism and conquest. Hutchinson seemed at least mindful of this tension when I broached the subject. “One of the early themes I liked was this idea that you arrive on a pristine world and slowly ruin it,” he said, showing off the player’s highly polluting jumpack. I told him that I sometimes felt bad exploring planets in No Man’s Sky. The tension between the colorful world and the impending corporatism was prominent. It’s impossible for players to hide from Kindred Aerospace’s commercialism as they play the role of explorer, scientist, botanist. Kindred’s space initiative was literally called the Pioneer Program, and their greed was highlighted throughout the demonstration. It seemed that some of Ubisoft’s canceled game Pioneer had lived on with Hutchinson after he left the company. Pioneer was originally conceived of in 2013 as a non-violent space exploration game but the project fell through. Ubisoft canceled it this January. Returning to his home base, Hutchinson was assailed by habitat television infomercials commercials where a chipper announcer rattled through Aerospace products, all of which were the same kind of Nickelodeon-quality grey goo. It’s entirely possible to leave much of the wildlife alone, but company assignments meant to encourage experimentation were a mixture of ridiculous and cruel, such as kicking small critters into lava. It felt like I was watching a sillier, anti-capitalist Metroid Prime. I’m into that. It was only after I’d left the session that I realized I forgot to ask the primary question on my mind. I emailed the Typhoon team to ask: Had the team considered the implications of using the word savage? I received a reply the following day. Journey to the Savage Planet stayed on my mind beyond the demonstration. I’m still processing my feelings about the game’s themes and implications, but its bright silliness and emphasis on hidden secrets were exciting. There’s a fun game here, with a cheeky anti-authoritarian and anti-capitalist streak. Players eager for a riff on 3D Metroid will get something to sink their teeth into when Journey to the Savage Planet releases in 2020.